Ted Strickland: Slowest Growing Budget in 42 Years. Martin O`Malley: Limit budget growth to below inflation. Jim Gibbons: Raise the amount of protection for property by $200k. Sarah Palin: Aim to reduce general fund spending by $150 million. Charlie Crist: Proposed the Anti-Murder Act. Martin O`Malley: Additional funding to hire correctional and police officers. Jim Gibbons: Increased funding and set up working group against meth use. Ted Strickland: State Contribution to Local Schools will reach 54 percent. Ted Strickland: Zero tuition increase in �08; Less than 3% increase in �09. Charlie Crist: Propose $3.8 billion to reduce class size. Phil Bredesen: $48M for state colleges for tuition, & $10M scholarships. Jim Gibbons: Gauge the demands of introducing full-day kindergarten. Sarah Palin: Fully fund K-12 and support early funding of education. Jon Huntsman: To produce first-rate students, pay for first-rate teachers. Tim Kaine: We raised teacher pay & required regular teacher evaluations. Tim Kaine: Include private & church schools in kindergarten & pre-K.
Kathleen Sebelius: Bioenergy Research Grant Program for renewable fuels. Kathleen Sebelius: Kansas Wind Working Group: 1% of energy from wind, & growing. Charlie Crist: Propose almost $70 million on alternative energy development. Tim Kaine: Key to success is availability of reliable, low-cost power. Charlie Crist: Appropriate $100 million to continue to restore Everglades. Martin O`Malley: Adopt the Clean Cars Act to fight global warming. Jim Gibbons: Committed $72 million for environmental improvement projects. Sarah Palin: Provide stability in regulations for developers. Sarah Palin: Convince the rest of the nation to open ANWR. Tim Kaine: Historic investments in water quality & open space. Tim Kaine: Prevent childhood obesity by improving health education. Tim Kaine: Virginia began as an experiment in global trade. Martin O`Malley: Implement a system of open and transparent administration. Jon Huntsman: Two-year cooling-off period before State employees can lobby. Ted Strickland: Access to Health Care for Every Ohio Child. Martin O`Malley: Pass the Maryland healthcare act to expand health coverage. Jon Huntsman: We mandate insurance for cars, but not children's health. Tim Kaine: 1 million Virginians do not have health insurance. Tim Kaine: Expand job benefits for members of the Virginia Guard. Jon Huntsman: Utah job growth at 5%; unemployment under 3%. Tim Kaine: Today's minimum wage is not enough to take care of a family. Ted Strickland: Property tax cut for 1 out of 4 Ohio homeowners. Charlie Crist: Reduce property taxes by doubling homestead exemption. Sarah Palin: Repeal �nuisance taxes� including the tire tax. Jon Huntsman: Removed half of the sales tax on food. Tim Kaine: Increase income tax filing threshold from $7,000 to $12,000. Tim Kaine: Exempt first 20% of home value from property taxes. Kathleen Sebelius: Kansas Innovation Consortium for high-tech investment. Jim Gibbons: Committing $170 million for highway projects. Jon Huntsman: Fund desperately needed road expansions. Tim Kaine: Re-zoning to account for transportation infrastructure. Tim Kaine: Visited VA National Guard members in Green Zone in Baghdad. 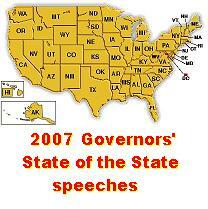 The above quotations are from 2007 Governor's State of the State speeches.